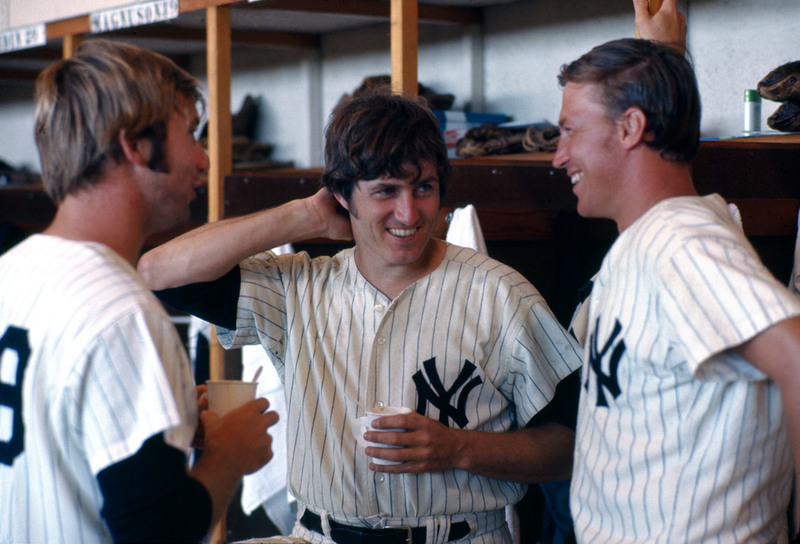 On what would have been his 72nd birthday, I am remembering my Yankee teammate and friend, Jim Hardin. I used to call him Twiggy. He started with the Orioles in 1968, and the first time I faced him was on September 27, 1969 at Yankee Stadium. The Orioles were in first place and Twiggy was doing well. This turned out to be a pitcher’s duel. Aside from Joe Pepitone’s Home Run to lead off the bottom of the second, neither team was getting many base runners. Twiggy gave up four hits in seven innings; I gave up six in nine, and the Yankees won 1-0. That’s how I ended the 1969 season with a 17-16 record. Twiggy ended with an 18-13 record – his first full season in the majors. That turned out to be his best season. Twiggy blamed the decision to lower the pitching mound for his arm problems. The Orioles traded Twiggy to the Yankees for Bill Burbach on May 28, 1971. I remember Twiggy being very excited to play in New York – and you have to remember, the Orioles were great in those days and we were not. He never said it, but I’m sure he was unhappy spending two consecutive World Series’ in the bullpen without ever getting to pitch. I know it frustrates me that I never played in a post-season game; Twiggy came so close, twice. One more thing: Twiggy got robbed on his trade to the Yankees, literally. After being informed of the trade, he drove his own car up from Baltimore in a rainstorm that night. He stopped to eat and came out to find that someone had broken into his car and stolen everything he had. Twiggy pitched his first game wearing Pinstripes on May 31, 1971, the second game of a Monday afternoon doubleheader against the Oakland A’s. He came in to pitch the top of the seventh after Gary Waslewski was pulled for a pinch hitter. With the A’s ahead 5-3, Twiggy got Larry Brown and Rollie Fingers out, gave up a double to Bert Campaneris, and the struck out Joe Rudi. After Frank Baker got a two-out single, Ralph Houk pinch hit for Twiggy. Not a bad first game. Sadly, Twiggy’s arm troubles persisted and he missed most of August. The Yankees released him at the start of the 1972 season. He hooked up with the Braves for a while, but his career was over. Twiggy built a new career in sales, and became a scratch golfer and master fisherman. He got his pilot’s license. In 1991, Twiggy and a couple of his friends flew his plane down to Key West, went fishing, and were on their way back to Miami for a golf tournament. Just a couple of minutes after taking off, his engine stalled. He crashed in a shopping center parking lot – and expertly avoided a little league field filled with kids not far away. All three passengers died in that crash. Jim Hardin, who was just 47, become the second of three Yankees to die in a plane crash. He was a good man and I miss him. Fritz, as Gina says…..thank you for remembering Jim. I spent the day golfing with him the day before the plane went down. We were good pals and hadn’t seen each other in awhile, so it was good to catch up as he smoothed it around Mayacoo and I hacked and thrashed my way along. He was a man’s man in all the right ways. Too many sliders did him in, or so he told me, back in a time where medicine and the business of baseball were different. It is very nice of you to take the time to remember Jim. By any name, he was a very good man.